US, 2002, 96 minutes, Colour. Robert De Niro, Billy Crystal, Lisa Kudrow, Joe Vitarelli, Reg Rogers, Cathy Moriarty- Gentile, Anthony La Paglia. The premiss of Analyze This was that a Mafia chief was having a mid-life nervous breakdown and went, however reluctantly and with macho self-preservation, into therapy. And it was on demand, even in the middle of his psychiatrist's wedding. The other premiss was that the psychiatrist had to take the place of the chief at a Mafia conference and carry it off with face-slapping bravado. It was a funny film, with Robert de Niro blubbering in his sessions and a bewildered Billy Crystal trying to marry Lisa Kudrow and avoid being whacked. Why not a sequel? While not as fresh as the original and the stars hamming it up, especially Robert De Niro (who proves with his renditions of West Side Story that singing is not his forte), it is an amusing show. It is more or less a repeat of the original except that De Niro fakes his collapse to get out of jail and execute a robbery and Billy Crystal gets to do more than sitting at a meeting. He is a co-robber as the co-dependency between client and doctor develops. Lisa Kudrow is not amused, especially at having the criminal now living with them. The new, entertaining element is the popular TV series, Little Caesar. De Niro and his associates are hired as technical advisers, especially for the star, played by Anthony La Paglia with his own Australian accent, needing to be coached on how to talk and be tough like a gangster. In his early career (in Betsy's Wedding), La Paglia was seen to be doing a De Niro. Now we have scenes with De Niro himself teaching La Paglia how to do it. Slight but an entertaining sequel. 1. An entertaining sequel? The popularity of the original? Expectations or this film? 2. The different New York worlds, the world of gangsters, the world of psychiatrists? Suburban New Jersey? 3. 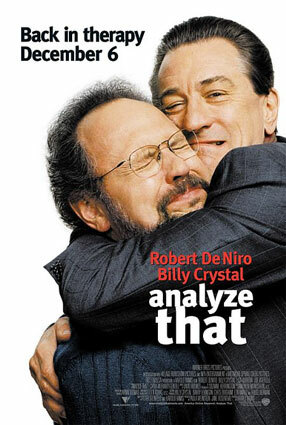 Robert De Niro and Billy Crystal and their differing acting styles, their combination? An entertaining duo? 4. The popularity of films about gangsters as well as television series like The Sopranos? The psychology of criminals? The film opening with the scenes from the TV series, Little Caesar - the television watchers, in the bar, in prison? The mockery of the genre? The humour of having Anthony La Paglia with his Australian accent being the gangster? The scenes, the impact of the producer, hiring Paul and the gangsters as advisers, their coaching, criticisms? Anthony La Paglia as a former look-alike to De Niro in his past career and the humour of his being coached by De Niro how to act - with the violent touches? 5. Ben Sobel, the psychiatrist, his family, his relationship with Laura, and her demands, Michael, fat, doing deals? The funeral, his imagination and his oration about his father? His discussion about the grief process? The phone call in the middle of the funeral? 6. Paul Viti, his past, in prison, television watching, the dining area, the attempts at his life, the stabbing in his cell? His being induced to breakdown, his singing the West Side Story songs - out of key? The interviews to prove that he was suffering a breakdown, Ben's interviews, sticking the needle in him? 7. His getting out, the authorities and the discussions, motivation? Ben forced to take him? The pressure on him? The authorities getting Paul to lead them to the other gangsters? 8. Paul and Ben in the car, his admitting his confidence trick? Going home, Laura's reaction, Paul's demands in the house, bringing the prostitute home? The family having to cope? 9. Paul and Ben, going out, the restaurant sequence and its humour, the discussions with the producer, the television deal, the gangsters on set, their advice? 10. Paul and his friendship with Jelly, taking the opportunity to meet other members of the gang? The cover of his taking on different jobs, the collage of his attempts to sell cars, at the jewellery shop and imagining the robberies _? His visit to Patti, the confrontation? 11. Reassembling the gang, exercising his influence, planning the job, under the cover of the television program? 12. Ben, his being caught up in the plan, being taken on the robbery, participating, the choreography of the robbery, the different gangs combining to work? Ben and his successful punching people out and feeling better? The build-up to the getaway, the consequences? 13. The police, trying to track down the heads of the gangs? 14. Paul and his planting the money in his rival's safe, the blame for the robbery on them, getting them out of the way? The possibility of him beginning a new life? The relief for Ben? 15. The popularity of Mafia films - and this variation on the theme?